The twins discover Abuelito, their grandfather, once searched for the same book, but he gave up the search when a friend disappeared. The book is rumored to be cursed, but Pen knows curses don't exist. Quin isn't so sure, and when Abuelito is attacked at the museum where he works, both twins are certain it has something to do with the missing codex. While Pen and Quin track down the mysterious book, greasy art professor Flores follows their every move, but someone else is watching them too - someone who doesn't want the Codex Cardona to be found. 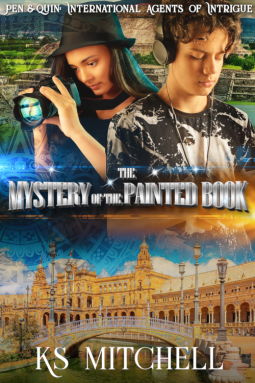 The twins must draw on their combined skills of art and technology to uncover the mystery of the painted book.